Dunes are not exclusive to the Oregon Coast. 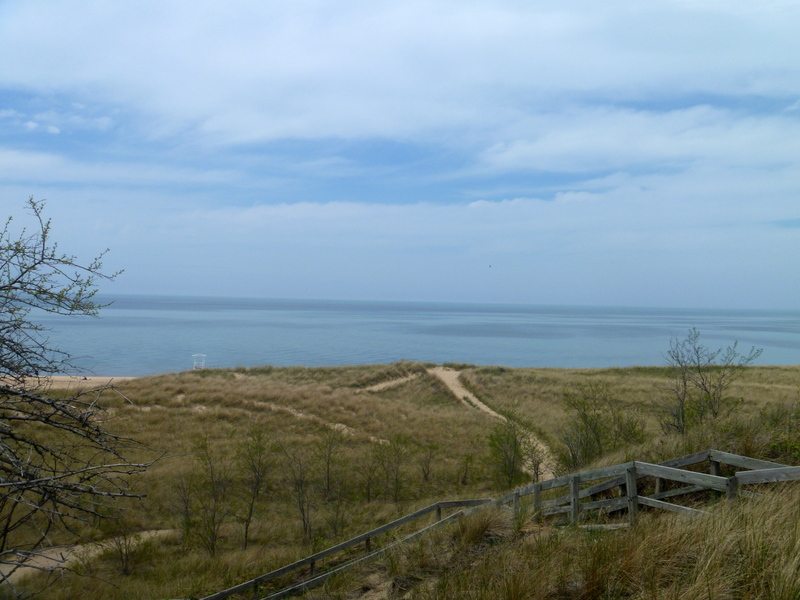 The Dunes on the eastern shoreline of Lake Michigan are the largest freshwater Dune system in the world. 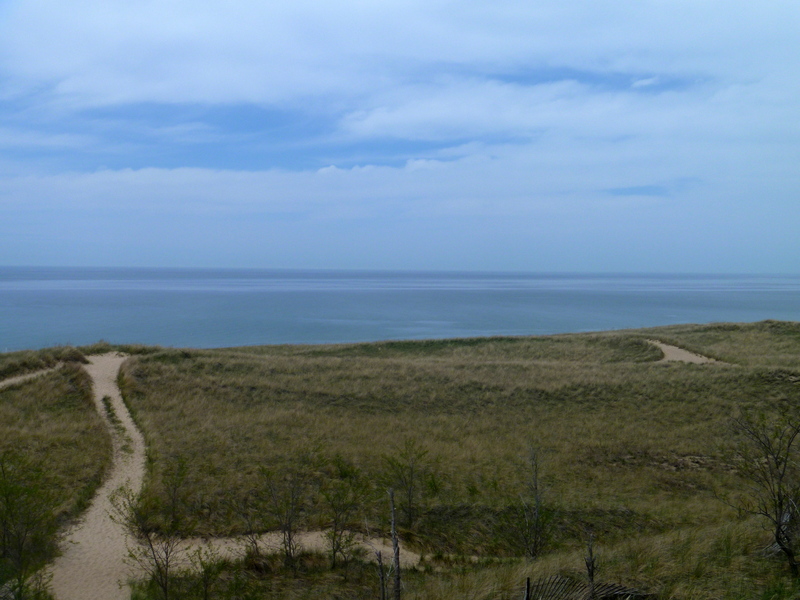 Dunes exist in many places all around Lake Michigan and in some places the Dunes rise several hundred feet above the surface of the Lake. 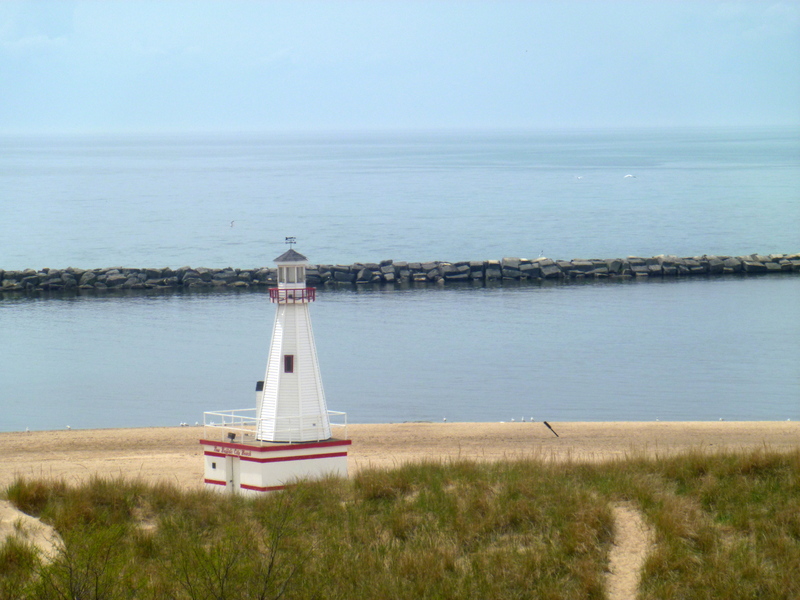 This shoreline is often referred to as the “Third Coast” of the United States. 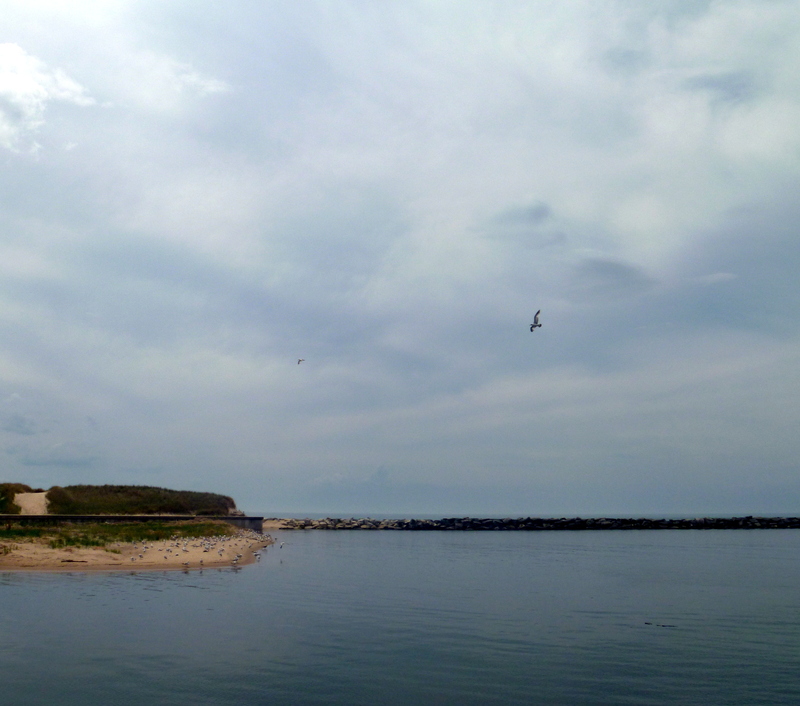 At the end of Whittaker Street is the beach access. 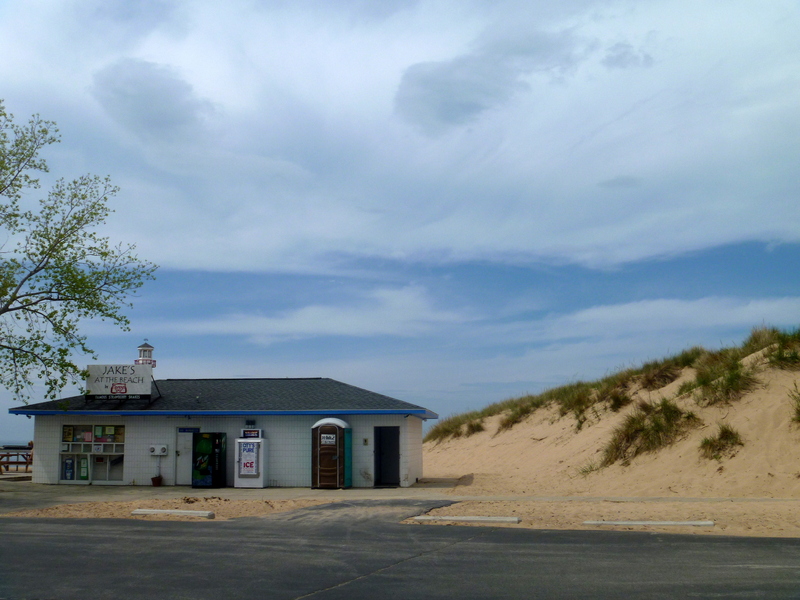 Jake’s At The Beach with its Famous Strawberry Shakes sits here next to the Dunes. Across the way is a hangout for the gulls. 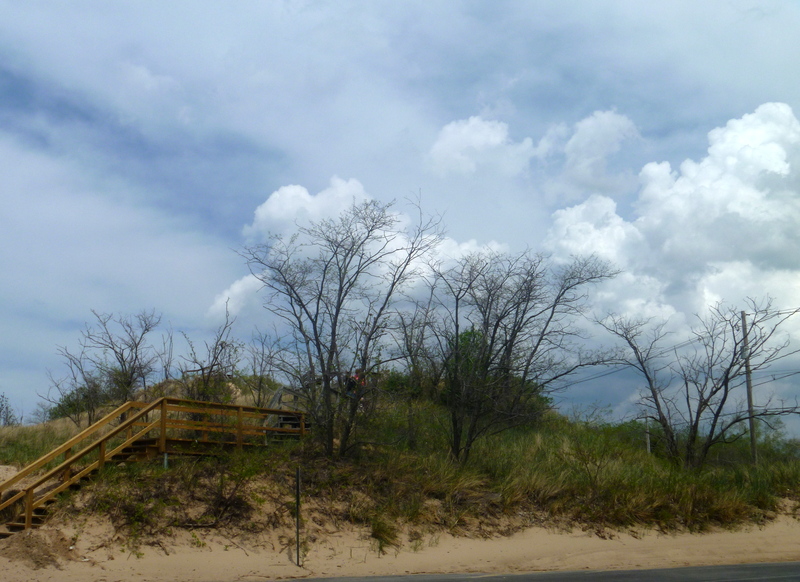 At the base of the stairs to this Dune was a crew cleaning sand off of the concrete walkway to the stairs. My Wyoming T-shirts always cause comment and one worker started to converse when he was distracted by a couple coming down the stairway asking if he was playing in the sand. Yes, he said, it’s never-ending. I climbed the stairs to the top of this Dune and the views were great. Again my Wyoming T-shirt was noticed by the couple up top and we struck up a conversation. From central Indiana, the gent visited here in New Buffalo growing up and did a lot of fishing on The Big Lake with his uncles. They were just here for the day and on their way to Elkhart, IN to visit his mom for Mother’s Day. A really nice job of putting all of this together. I a, going to Colorado next week & will be away until May 20th, so would appreciate your not sending me any more “chapters” of your Umpqua Story until after my return. Thanks. Marg: The email notices are automatic. Just ignore them while you are gone and you can catch up when you return or continue to ignore them. My fav scenic “stuff” is Sierra Mtn and its pine trees. Got any visitations you’ll be doing of this “kinda stuff” (Lol) in Oregon? Most of the posts are about the Oregon Coast. I sometimes get sidetracked by places in Wyoming, Michigan and points in between. Have not been to Sierra Mtn so am not familiar with that area.